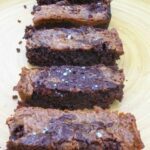 Salted caramel and brownies are two of my favourite things, so what could be better than combining them both? Not much as it turns out. 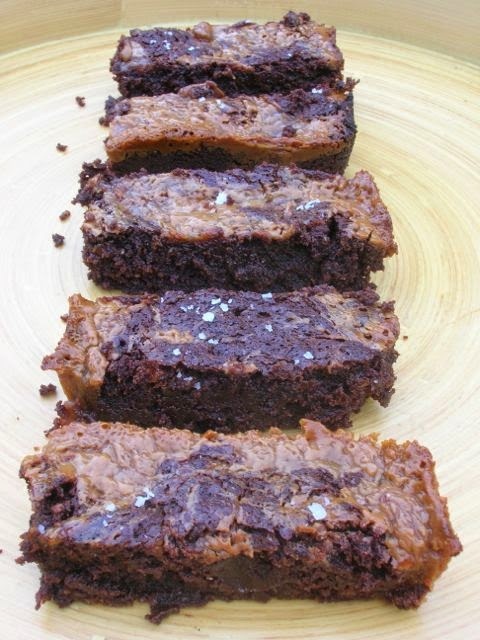 Read on to find out how to make this divine recipe for Cornish sea salted caramel brownies. Two splendid Cornish products came into play with these Cornish sea salted caramel brownies. They were, in large part, responsible for these delectable treats. I muscled in on a Twitter conversation between Cornish Sea Salt and Rodda’s just when pictures of sea salted brownies were being shown. Well that was it, I had to make some. So I did, a few weeks ago now. I pretty much used the same recipe as I did for the Marmite Caramel Brownies I came up with last year, but the method was different and obviously I didn’t use Marmite. I wanted to make a brownie batter using a rich dark chocolate so as to make a good foil for the sweet salted caramel. Rather than sandwiching the caramel as I’d done previously, I decided to swirl it through the batter. There’s no way to describe these brownies other than sublime. The caramel, which had honey notes, was perfectly salted. 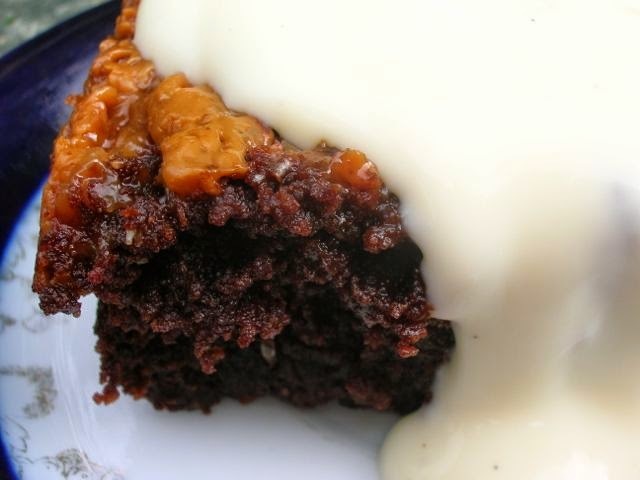 It created a squidgy interior to the brownie with a chewy toffee crust. Despite their deliciousness, CT and I weren’t able to eat them all at one sitting and they lasted us over the next few days. By this time they had taken on the consistency of fudge – two for the price of one. My oh my! I served these Cornish sea salted caramel brownies with Rodda’s clotted cream custard. It happened to go perfectly, both when the brownies were warm and when they were cold. Despite the rugged terrain and unpredictable weather, we’re quite a decadent lot in Cornwall. If these aren’t enough to tempt you, head over to my Bake up a Brownie board on Pinterest. You’re bound to find some inspiration there. Thanks for visiting Tin and Thyme. If you make these gorgeous Cornish sea salted caramel brownies, I’d love to hear about it in the comments below or via social media. Do share photos on social media too and use the hashtag #tinandthyme, so I can spot them. For more delicious and nutritious recipes, follow me on Twitter, Facebook, Instagram or Pinterest. Cornish Sea Salted Caramel Brownies. PIN IT. I’m sending these Cornish sea salted caramel brownies off to Javelin Warrior for his Made with Love Monday. They also go to Emily over at A Mummy Too for her #recipeoftheweek. 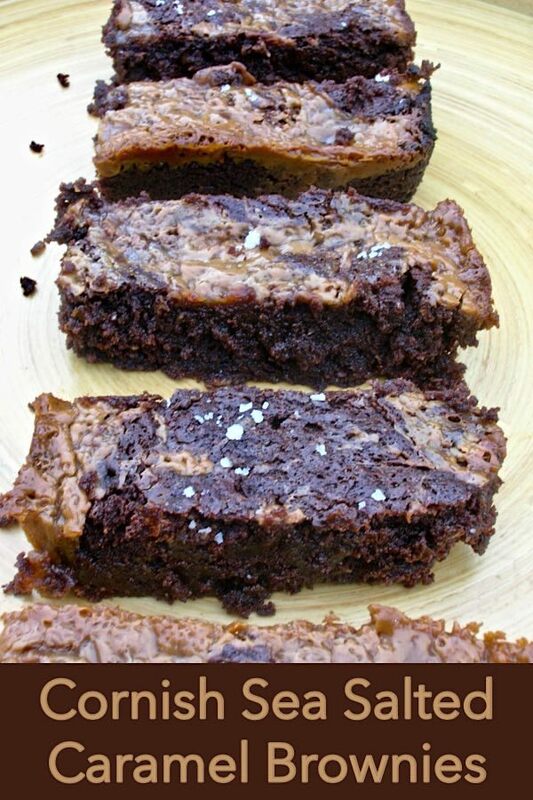 If you like sweet and salt together you will love these brownies. Melt the honey and salt in a pan over a medium heat, then slowly add the sugar and leave for a few minutes to melt and lightly caramelise. Heat the cream in another pan to just about boiling. When the sugar has reached a golden caramel colour, add the cream, standing well back in case of spitting. Stir vigourously and continue to cook for a few minutes until the caramel is thick and golden but still liquid. Remove from the heat and leave to cool. Melt the butter and chocolate in a large pan over low heat. Remove from the heat, add the sugar and stir. Beat in the eggs one by one, then sift in the dry ingredients. Stir until just combined, then pour the mixture into a 20 cm square mould (line as appropriate). Spoon the cooled caramel over the top, then swirl the mixture around to create a ripple effect - it will look very liquid at this point, but don't worry. Bake at 180°C for 25 minutes until well risen with only a slight wobble. Scatter a large pinch of Cornish sea salt flakes over the top. Many thanks to Cornish Sea Salt for sending me a tub of their new flakes to try out and to Rodda’s for the custard. You can see my review of these products on the Cornish Cornucopia post. These sound divine!!! And they look so moist…. Total decadence! I am not sure they would last more than an hour in our house! These sound amazing! And I’ll have to make the marmite brownies for my husband’s birthday. Right then! I’d better make them. I think you better had Suzy. These look drool worthy and so delectable. Oh my word, if only I could reach into the screen and grab one. The moment I hear salted caramel I need to eat some, pronto! I love anything salted caramel. They look amazing. I have yet to cook with salted caramel. Sad right. I look at these with serious envy. 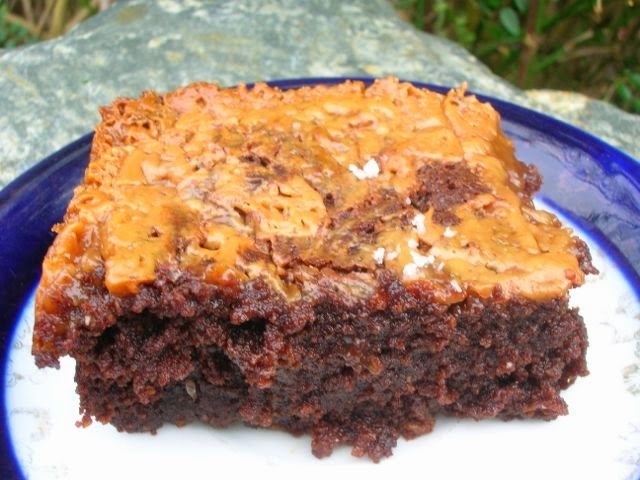 I love these brownies especially with the salted caramel! Oh wow they look good. How depressing that I can’t reach in and have one! wow, your blog is really amazing! this is like heaven to me, as i’m a major chocolate fan!